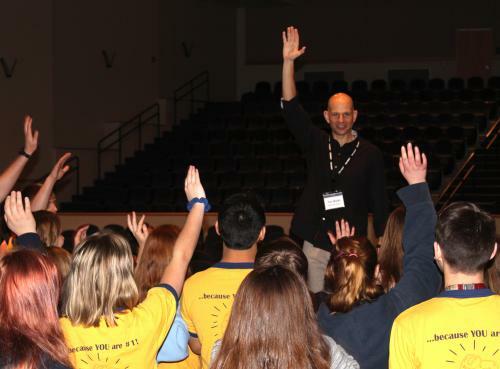 Using stories, repetitive hand-clapping, skits and games, guest speaker Ted Wiese helped Chanute students look at themselves in a different way and discover what they can do to make a positive impact at Chanute High School and Royster Middle School. Wiese has been speaking with youth about team-building and leadership for years. 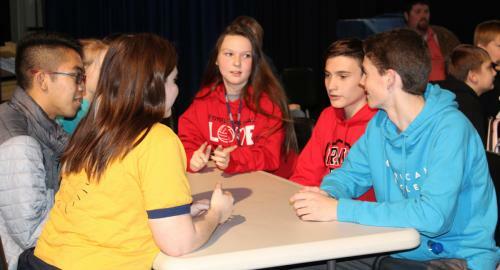 Monday he addressed all students at CHS and RMS, and then worked with leaders in student council and government and leadership class. Using interactive games the students learned the importance of energy and enthusiasm, developing teamwork, listening to others and problem solving. At the assembly, Wiese told the students that people are quick to point out everything that is wrong, or when things don’t work. “Each and every one of us has to think about how to be part of the solution and not part of the problem,” Wiese told the students. Working towards finding a solution will work everywhere, in the cafeteria, the classroom, commons area and athletic field. “Students who are willing to be part of the solution and not part of the problem, take action,” he said. When someone takes action, they gain experience, with experience they gain confidence. With confidence, students become willing to take action, he pointed out. He asked three girls to join him on the CHS stage to demonstrate why people don’t take action. After blindfolding the girls with masks and goggles, he told a story about eating lunch with students in Honduras who shared a bowl of squiggly newts with him. He asked each girl to hold out their hand so he could drop one of these Honduran newts into it. At the first touch, two of the girls jumped and squealed with exclamations of “not happening.” Only the freshman “with the attitude” held out her hand and ate it. Students are in high school for four years and those years will shape the rest of their life. He asked students to clasp their hands together and to fold their arms over their chest. Is the right or left thumb on top or the right or left arm? Try doing it with the other arm or thumb on top. How each person does both is a habit. When they try and do it differently it’s uncomfortable. “I think they do it because it’s a habit. Try saying great,” he told the crowd. “The attitude you bring to school every day is the biggest thing you can do,” Wiese said. “The way you talk to yourself day in and day out affects your attitude,” but those habits can be changed. Wiese shared a story about a chance collision in the school hallway between two seniors, one the captain of the football team and another boy named Bill, who’d spent four years at school in silence, with no one speaking to him except a teacher. Kevin, the football player, began to notice Bill when he passed him in the hallway, and the way he walked slumped forward with his head down. He wondered why no one talked to him. One day, as Bill approached, Kevin stepped up and said “Hi Bill.” Bill looked up, waved, and went on. Kevin continued the practice, saying hi every time the two passed in the hallway. Then he noticed Bill in the lunchroom, how he stood with his tray of food and waited until a table emptied, before sitting down by himself. Despite some objections from his teammates, Kevin asked Bill to sit with him at lunch, every day. With time, the boys began talking and people began to notice Bill walking a little taller and smiling. Bill’s mother called the school principal. She said she didn’t know what they were doing, but for the first time her son had gotten up in the morning wanting to go to school. By chance, Wiese told the students at CHS, one student took action and it resulted in changing the actions in an entire school. 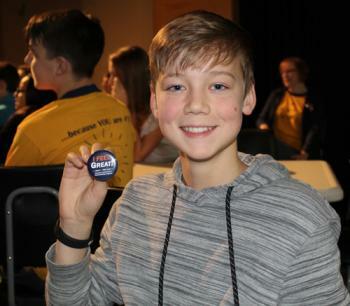 As the students left the auditorium, Wiese passed out buttons that read, “I feel great.” He told them to keep that button somewhere they will see it every day and serve as a reminder to change a habit, change an attitude and create a positive difference in their school.